I’m as guilty as the next person — I collect a lot of media when I am online, gathering ideas, considering possibilities and sharing resources with my many friends all over the place. What I don’t do enough of is curate this digital debris, putting things into a context for others to consider (or for myself to consider when I finally make my way back to it). I was thinking about this yesterday as I read through Tanya’s Storify collection of a series of collaborative poetry projects that we were part of in the Rhizomatic Learning experience earlier this year. Of course, I remember doing all of what she documents, but her ability to collate and contextualize the “moves” that we did as some projects unfolded is such a great and powerful example of curation. 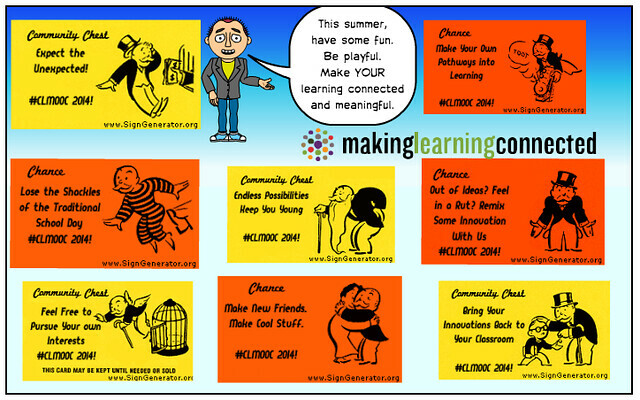 She makes visible the thinking, the learning, the collaboration, and in doing so, Tanya situates how we all used technology to create some wonderful works together. I’m so grateful for her work, and it reminds me that I need to do more of that kind of curation, to give anchor points to the pathways that I am taking here, there, everywhere. Her Storify collection indeed tells the story of collaboration by knitting together tweets, and other media, so that what emerges is a narrative of discovery. That’s the power of curation. The artwork by Naresh Kumar (who does many of the Campfire books) captures the spirit of the times, when innovation and invention were in the air, and when many people were suddenly working on similar inventions in different parts of the world. As I mentioned, Marconi gets only scant mention, even though his work on transmitting voice and data over wires (and wireless) was also underway around the same time. I guess three inventors was enough to write about. He gets mentioned during some legal proceedings over who invented what, and when, and who would get credit for the inventions. I want to mention a nice bonus at the back of the book, too. In the spirit of the “Make,” the graphic novel details how a kid can create their own version of a rudimentary telephone, with a glass, some water, a nail, batteries and string. I love the story ends with an invitation to make a telephone and maybe have kids begin their own path “to change the world.” Nicely done. I had an interesting moment recently with two of my classes. We were watching the movie version of Tuck Everlasting (after reading the novel) and there is a scene where the Stranger (played by Ben Kingsley) stops alone in the woods and pulls out a handheld mirror, holding it up and examining his own facial features for signs of age. I wish I could share a screenshot of the scene. He’s holding the mirror up high in the sky with his left hand, staring up at it with a stern expression while touching his face with his right hand. I never thought twice about it because it seemed obvious what he was doing. This is the first year that this has happened with the movie, and it reminded me again of how fast pop culture and technology is flowing through our world. A year ago, only a scattered few might even have heard of a selfie. Now, it’s become a youth touchstone, an automatic response to anyone who holds any kind of screen in front of them. 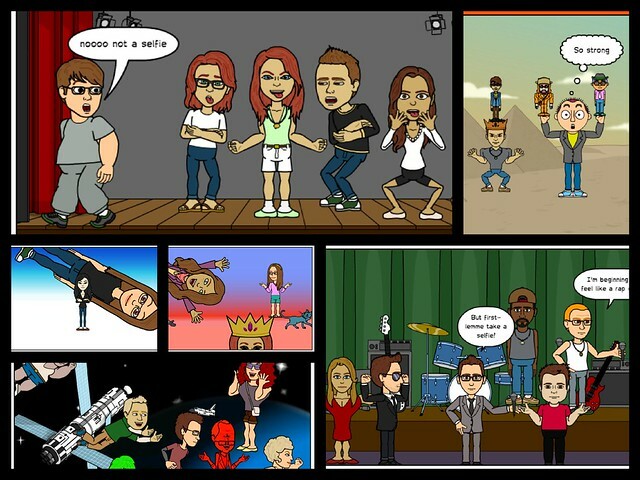 Then, I brought the students into Bitstrips and told them: “Create a webcomic selfie and feel free to make it crazy.” Most were very excited about the assignment — they love making and using avatars in our comic site. But one kid dropped his head. Maybe the tide is already turning. On Teachers Teaching Teachers last night, I had the fortunate opportunity to hang out with host Paul Allison and some teaching folks who contributed or edited the upcoming collection of short essays by educators connected to poetry. The book (Teaching with Heart) comes out in a few days, but it was a great experience to talk about how poetry informs us as teachers, and to share some of our writing. You can view the chat room discussion, too. In Teaching with Heart: Poetry that Speaks to the Courage to Teach a diverse group of ninety teachers describe the complex of emotions and experiences of the teaching life – joy, outrage, heartbreak, hope, commitment and dedication. Each heartfelt commentary is paired with a cherished poem selected by the teacher. The contributors represent a broad array of educators: K-12 teachers, principals, superintendents, college professors, as well as many non-traditional teachers. They range from first year teachers to mid-career veterans to those who have retired after decades in the classroom. They come from inner-city, suburban, charter and private schools. I am one of a number of contributors to a new collection coming out this month in which educators write short essays about poems that are near and dear to their heart. Teaching with Heart: Poetry That Speaks to the Courage to Teach follows the path of two other collections that also engaged teachers in reflective inquiry and pointing to powerful poetry. As part of the pre-publication push, I created a short Tellegami video about the poem that I chose, which was Taylor Mali’s famous “What Teachers Make” poetic response to a question posed to him at a dinner party. The poem is powerful on the page, but not nearly as powerful as watching Mali (who wrote the introduction to Teaching with Heart) perform his piece as a poetry slam in person. Meanwhile, Paul Allison at the Teachers Teaching Teachers webcast is hosting a bunch of us teacher/writers this coming Wednesday night to talk about the book, about poetry, about teaching and, knowing Paul, probably a whole lot more. The webcast takes place at 9 p.m. on Wednesday night at EdTechTalk, and you can join in the chat, too. I came across a post some time back (this post has been in my “draft bin” for a bit) from Animation Chefs about using Vine for making stopmotion, and thought: well, maybe. I gave it a try with some Legos. Yeah, it worked, but the six seconds and my own lack of an iPad holder made the movie a little jumpy. Still, kids could easily make something like this. I just did a lot of little swipes in the app, moving the pieces forward, swiping again, etc.